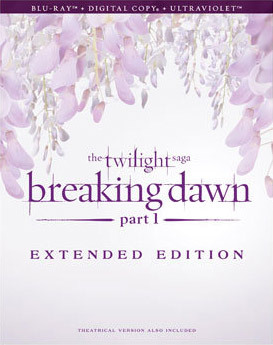 Twilight: Breaking Dawn – Part 1 Extended Edition Coming to Blu-ray/DVD. Kristen Stewart, Robert Pattinson and Taylor Lautner star in the fourth installment of the vampire/werewolf saga. Summit Home Entertainment will re-release The Twilight Saga: Breaking Dawn – Part 1 on DVD and Blu-ray March 2, 2013, now featuring eight minutes of never-before-seen footage selected by the director. You can see the special features below. In the fourth installment, a marriage, honeymoon and the birth of a child bring unforeseen and shocking developments for Bella & Edward and those they love, including new complications with werewolf Jacob Black. In the fourth installment of The Twilight Saga, a marriage, honeymoon and the birth of a child bring unforeseen and shocking developments for Bella (Kristen Stewart) and Edward (Robert Pattinson) and those they love, including new complications with werewolf Jacob Black (Taylor Lautner).